Organizations that successfully transform marketing and generate remarkable results for their businesses have one thing in common: strong, transformative leaders who are willing to disrupt the status quo. 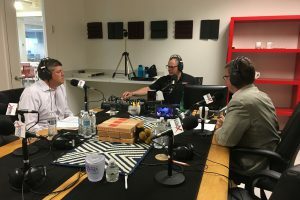 In a recent Business RadioX interview, Dave Sutton of TopRight interviewed Dan Campbell, the Founder & Executive Chairman, Hire Dynamics. Dan shares details on the steps he took to successfully transform his company while creating strong employee loyalty. Employer branding is key to Hire Dynamics’ ability to attract top talent driving their stand out success. Recently named one of the top ten “Best Places to Work” by the Atlanta Business Chronicle for its 10th year running, Dan Campbell discusses the importance of identifying their value proposition to convey what differentiates the Hire Dynamics story. Transformational marketing leaders understand that to drive transformational change it starts with the people within the organization. It can’t just come from the “top-down”, but it must be lived and breathed throughout the company culture. This requires an understanding and commitment to the Story that is pervasive. Dan notes the irony plaguing many staffing companies, whose job it is to place the right talent into the right positions, but they often do a poor job of creating a fulfilling culture for their employees to feel valued. Hire Dynamics saw the opportunity to differentiate themselves and “own their side of the street” by focusing on fostering a positive company culture. Dan credits the companies culture to their fast, but steady, growth that resulted in their recent acquisition by MSouth Equity Partners. List to the full interview with Dan Campbell below. Successful leaders practice Transformational Marketing to lead company-wide change, altering how they market, communicate, and engage with their customers. It takes a lot of heavy lifting to successfully transform marketing. There will be challenges, but working through those challenges is ultimately worth it when the results are delivered. Download TopRight’s Guide to Transformational Marketing Success and learn how to use the 3S’s – Story, Strategy, and Systems – to drive remarkable customer experiences. Hear from other Transformational Leaders that are driving change in their industries, business models, and organizations.